Map No. 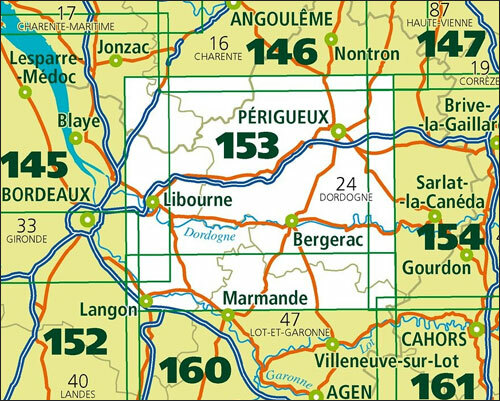 153, Périgueux - Bergerac, at 1:100,000, part of the TOP100 series from the Institut Géographique National (IGN). These exceptionally detailed, contoured and GPS compatible road maps which include English language map legend are ideal for exploring the French countryside by car, by bike, or even on foot. Used by millions of locals and tourists alike, this series provides an excellent balance between coverage of a sufficiently wide area and detailed road presentation, plus topographic information not found on other road maps of France. For several decades now these maps, previously known as Série Verte, have been one of Stanfords’ leading bestsellers. Current edition of this title was published in February 2015. PLEASE NOTE: to see the full specifications of the cartography (contour interval, GPS compatibility, etc) and the list of all the titles in this series please click on the series link. This title covers (as shown on our coverage image) an area along the western part of the Dordogne River from Siorac-en-Périgord to just beyond Libourne, extending north to Brantôme and south to Cancon. Coverage includes the vineyards of St-Emilion and Pomerol, Coutras, Montpon-Ménestérol, Chalais, Montguyon, Ribérac, St-Aulaye, Mussidian, St-Astier, Cadillac, Sauveterre-du-Guyenne, Montségur, Ste-Foy-la-Grande, Miramont-de-Guyenne, Castillonnès, Beaumont-du-Périgord, etc.